I’m rather late in posting about this but last week I went along to the Sunday Times Oxford Literary Festival at Christ Church College, Oxford. I was hoping to spend the best part of a day there but one session that I was hoping to attend — an interactive culinary lecture in the college’s kitchen had been booked up before I arrived. I did get to see the main event I’d planned to see — a conversation between the Sunday Times literary editor, Andrew Holgate and David Nicholls, the author of the phenomenally successful novel One Day, which I’ve mentioned a few times before on the blog. I arrived in plenty of time and got a good seat in the marquee in the grounds of the college. I was interested to see the size of the audience, which probably numbered at least a couple of hundred and its composition, which was probably 70-80% female, as was the gender of the questioners at the end of the session. While it’s true that women read the majority of books, it seemed from the interest in the author and the nature of some of the questions that Nicholls has done something fairly unusual in being a man writing a book about relationships that has a broadened appeal beyond conventional genre boundaries. This seems to send some commentators into confusion, such as in this article on the Orange Prize on the Guardian website by Jean Hannah Edelstein that states: ‘Then there’s the fact that David Nicholls’s One Day has been such a runaway success among both men and women, despite the fact that it succeeds as a novel because of its careful adherence to the tropes of so-called women’s commercialÂ fiction (but, hey, it has a manly orange cover).’ After reading this many times I still don’t understand this sentence because I’m not sure which qualifiers apply to which phrases and its internal contradictions (e.g. despite it succeeding, tropes that are so-called). I’m still not sure whether she approves of men writing books that appeal to women — women who can be marketed to by the ‘tropes’ of this ‘so-called’ genre (obviously not Guardian readers or columnists). And if it doesn’t really matter to the argument about whether there should be an Orange Prize then why has she thrown it in — maybe to say that here’s a man invading traditional women’s genre-gender territory so that perhaps justifies a prize that excludes men? And ‘manly orange cover’ — what does that say about the Orange Prize? Perhaps the answer to why Nicholls works so naturally in this genre is explained by his unusual background for a novelist. The discussion spent rather a long time, a bit too much for my liking, on Nicholls’s biography rather than his novels. 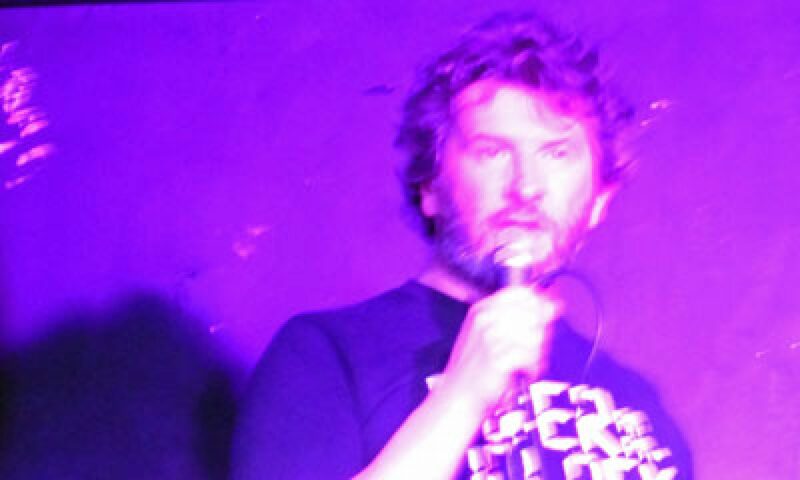 He studied English and Drama at Bristol and tried to make a career as an actor — which has supplied him with a library full of self-deprecating anecdotes. Through working with friends and colleagues he branched out into drama writing, eventually giving up acting altogether and working mainly on film and television, including the third series of Cold Feet, which has a demographic of principal characters and audience that’s very similar, I imagine, to One Day. A few critics, and Amazon reviewers, have said that One Day is a visual novel to the point that they think it’s half-way, if not more, to being ‘a screenplay in disguise’ (Nicholls’s own quotation). The author refutes this — he’s written screenplays and deliberately used fiction as a form when he realised that it was more suitable for the idea he was developing into what became his first novel (Starter for Ten). One Day is his third novel and the first one he wrote in third person — a narratorial style that he found almost like cheating because ‘you can tell the reader things’ rather than have to carefully choreograph exposition using action, as in drama. While the novel certainly uses the tropes of fiction generally, it’s probably true to say that a lot of its commercial appeal is because it is reminiscent of film and TV drama — partly in theme, style and structure. Perhaps the duality of the characterisation borrows from drama more than fiction — it’s both Emma and Dexter’s story — neither really predominates, although I do think Emma is his real favourite. This goes against a lot of creative writing course advice — ‘a novel must be one character’s story above all others’. Hmm. The clever premise — of revisiting characters on the same day of the year for twenty years — definitely has the air of the dramatic set piece. I didn’t realise how autobiographical the novel was — all the locations where the action is set on those 15th Julys were places (apart from the one in Goa) where David Nicholls actually was at the time — Edinburgh, a Greek island, a tawdry London fast-food restaurant, Paris and so on. The device of using the same day of the year also allowed some of the biggest life-events, weddings, for example, to happen ‘off-stage’ — another effective dramatic technique where sometimes it’s more powerful to relate important moments in a plot via the reactions of characters rather than depict them literally. It was interesting to listen to how the idea for the novel developed and, then, to see in hindsight what universal themes Nicholls had tapped into. If I remember rightly, he started thinking about the novel as a reaction to the prospect of becoming a father himself (parenthood features in the novel but not as a major factor in the plot) and also reaching the wrong side of forty — what happened to my life? He said he looked back in eternal regret that he’d been at university a couple of years too early and had missed out on the party and rave culture of the early 90s, unlike many of his friends and Dexter in the novel. Looking back through the lens of impending parenthood also made Nicholls reflect on the changing nature of friendships — in your twenties you feel you had intense relationships with friends for whom you felt you’d sacrifice anything but by your forties, while you were still perhaps good friends, the relationships were more measured and different. It was this maturing process that he was interested in capturing in the book. He also said, relating back to the hedonism he felt he missed out on, that some of his male friends had behaved like complete idiots, ostensibly self-centred, egotistical and destroying relationships in their twenties and this may have been related to circumstances — Â and that monstrous as they may have become, these people weren’t actually bad. The hero of One Day, Dexter fits this mould and Nicholls said he used two techniques to humanise him. Firstly, he is given a foil in Emma — the woman who comes from a contrasting background and who sees the germ of decency and attraction in someone who becomes a New Laddish oaf. Secondly, he said he was able to use the odd piece of interior dialogue to signal that Dexter had a twinge of regret when behaving badly and that redeemed him to many readers in a work of fiction — something that would be more challenging in drama. It also fits an archetype of a misguided man being put on the straight by a good woman. Nicholls also said something interesting about romance as a genre that he’d learned through writing drama — romances are only really interesting if there are obstacles in the way of the lovers. And many of the traditional obstacles that provided sport for writers in the past were no longer relevant — particularly sexually. Class is also much less of an obstacle, although it features in One Day to some degree. I realised that I must have unconsciously realised this myself with my own plot because it hinges on an obstacle that is still problematic enough to create conflict — adultery and the lure of another. I also got an interesting insight into the work involved in being a writer. David Nicholls said his biggest frustration at his novel’s success was that he’d spent two years not having time to write a follow-up — being involved in promotion and the book’s film adaptation. I also felt sorry for his arm as a long line of people queued in the marquee afterwards for book signing. I tagged along right at the end of the queue so saw that he was genuinely keen to engage with his readers, given the time constraints. When it was my turn, I had a brief chat with him in which I mentioned I’d e-mailed him last year through the book’s website to comment on his compilation tape playlists (which I’ve mentioned on the blog before). He remembered my e-mail (as he mentioned The Smiths before I’d had a chance to prompt him). I mentioned my creative writing courses and he was interested enough to ask where I was studying, asked after the progress of my novel and wished me luck in pushing on with completing it. And if someone who’s just sold 600,000 copies of his book in this country wishes me luck then I really ought to get on with it. 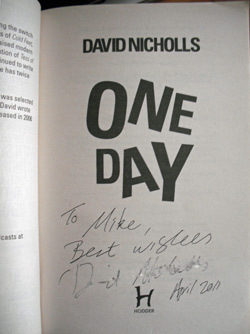 Here’s my signed copy ofÂ One Day — David Nicholls’s signature really isn’t that messy — I just obscured it a bit in photoshop so it can’t be copied. The playing out of lesser events ‘off stage’ is something I am looking at now I am at the reveiw/rewrite stage. Great book,really loved it. But then I caught the last series of a tv show he had written on and discovered he had lifted the ending and only real major plot twist from it. He had also borrowed the lost letter scenario from tess,which he was adapting for the BBC at the time he wrote one day. Still love the novel but these things really took the shine off it for me.